Bruschetta is so easy to make. And it's healthy. The recipe I'm posting is exactly how I like my bruschetta. You can add or subtract ingredients depending on what you like. 1. 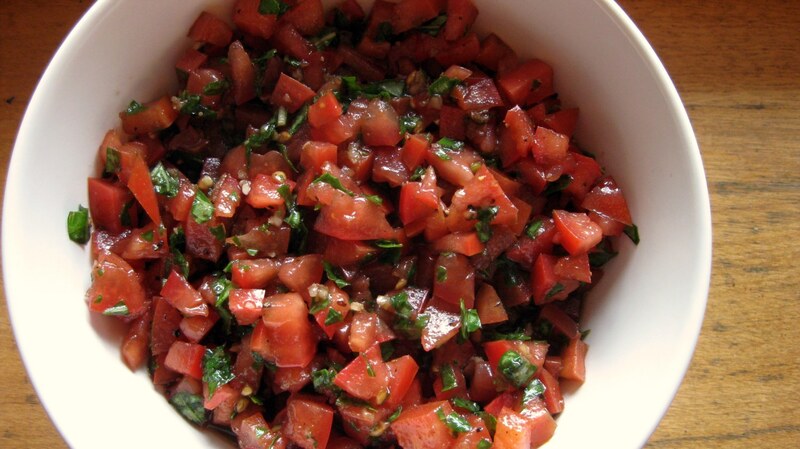 Mix tomatoes, garlic, basil, salt, pepper, olive oil and vinegar in a bowl. Refrigerate for 1 hour prior to serving. 2. Slice bread into equal 1/2 inch thick slices. Toast on a baking sheet in a 400 degree F oven for 10 minutes. Allow to cool before topping with the tomato mixture. Serve and enjoy! This is such a great snack. Easy to make and healthy! Note: This is an old post that got a bit of a makeover. I made some bruschetta for guests this past weekend and took a better picture than what I had previously posted. I also created a printable recipe link so I figured I'd post it again. Enjoy! I am making it now with a tomato from my tomato plant! Mmm! Thanks! I won't have tomatoes of my own until July, but I do love bruschetta!